Delighting not on Helikon, but in Eden. This Saint was during the reign of Emperors Gordian (238-244) and Philip (244–249), and was from Thessaloniki. Arrested for being a Christian, she was brought before the Duke of Corinth named Perinios. 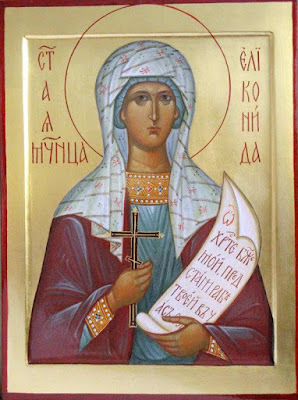 Because she was not persuaded to sacrifice to the idols, but proclaimed Christ as the true God, for this reason she was first tied by her feet with the strap of the yoke of the ox, and thrown to the ground. Afterwards the Saint was put into a cauldron of lead, asphalt (which is like sulfur) and pitch, but she came out of it without being harmed. Then they shaved her head to shame her, and lit her body on fire. The Saint then entered the temple of the idols, and by her prayer she toppled the idols of Athena, Zeus and Asclepius to the ground. For this reason her breasts were cut off. When Justin the proconsul succeeded Perinios, the Saint was brought before him as well, and being unable to persuade her to make a drink-offering or sacrifice to the idols, she was put into a flaming furnace. Since the flames did not completely touch the Saint, they then laid her onto a fiery copper bed. Th Archangels Michael and Gabriel then appeared to her, restoring her flesh to health, which had become unloosed and was melting to the ground. Therefore she was kept unwounded by this torture, and thrown to the beasts to be devoured. The beasts however did not completely touch her, but of the servants of the proconsul one hundred and twenty were killed. 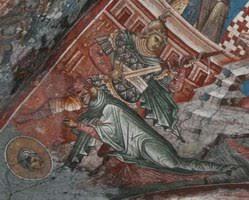 For this the Saint was condemned to death, and the blessed one was beheaded, and she went up crowned into the heavens.